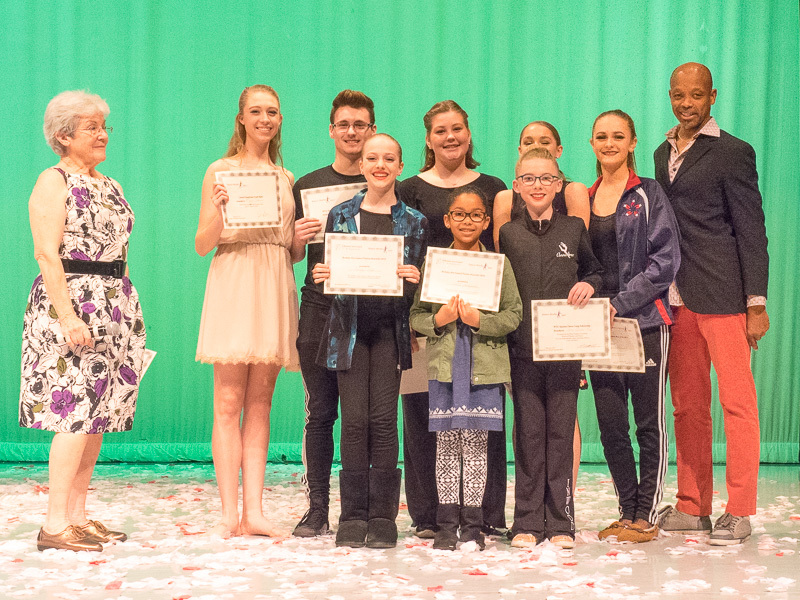 Malinda Shaver of the Berkeley Arts Council and General Hambrick from WV University with scholarship winners from the 2017 Dance Works Festival. The 2017 Dance Works Festival is in the books after a mad scramble to adjust after an unexpected disruption of its primary venue at Musselman High School. Through the efforts of Arts Council president Malinda Shaver and the members of the committee of dance advisors, the event was completed successfully by combining four different venues in Hagerstown and capping it off with the Gala Performance at Musselman. Thanks to the folks at Barbara Ingram School for the Arts to helped make arrangements at the City Ballet School, the Grand Ballroom, and the Masonic Temple, the dance students from Berkeley and Jefferson County, West Virginia and students from the Barbara Ingram school in Hagerstown, experienced workshops from eight master level instructors in ballet, tap, modern, jazz, hiphop, musical theatre, and acting disciplines. The Festival was sponsored by the Berkeley Arts Council in association with the Inwood Performing Arts Company, Dance Dimensions of Hedgesville, Rhythm n Motion, and WHS Synergy Dance Ensemble at Washington High School in Jefferson County, WV.